During the coldest parts of winter, thousands of bees form a tight cluster around the queen and their winter store. The queen is kept warm by the bees as they consume up to 25kg of honey during this period. By shivering their wing muscles they generate heat that maintains the centre of the cluster at 25°C. 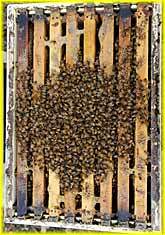 On warmer winter days, bees positioned on the outside of the cluster push their way toward the centre, the central bees are moved outward thereby rotating its members. If the cold days last too long, the outside layer of bees die giving a slow attrition that will continue until spring. As the days get longer, the bees begin feeding the queen royal jelly stimulating her to lay eggs, slowly at first but gathering speed in spring. The queen lays in cells central to the cluster and the bees increase the temperature to 36°C, which is optimum for raising brood. The first bees reared are workers but as spring gathers pace, the colony starts raising drones. 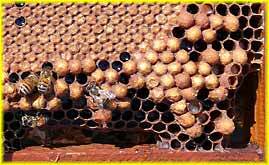 As the honey comb structure (cells) are build by workers, they control the number of drone cells and where they are built. Drone cells are larger and require more space and so placed toward the outside of the frame. Placing drone cells in the centre upsets the balance of the precise hexagonal structure. 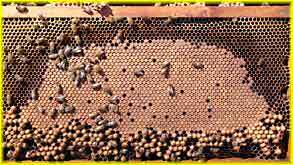 The worker bees are able to steer the queen toward areas of the comb to lay drones or worker bees and they can prevent her from laying by partially filling the cells with honey. Even if an egg is laid, the bees can dispose of it giving them total control of their colony.